Veterans in China are finding they are being tossed aside by the state and left unable to provide for themselves or their families. As a result, they are protesting. 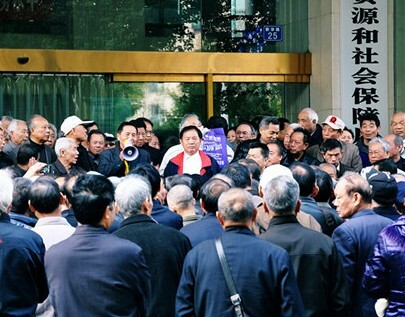 On Nov. 8, 500 retired veterans gathered to protest in front of the Labor and Social Security Bureau in Wuhan, the capital of Hubei Province in central China. They sought to resolve issues with their social security. During the evening, a large number of special police arrived. The two sides got into a clash, and about 10 people were injured. The reporter was not able to interview any of the protesters, but a veteran named Huang Jianzhong from Yantai in Shangdong Province in eastern China said that he had already heard about the incident in Wuhan on his cellphone. Many veterans live in poverty in China, he said, especially those who can’t find jobs. Those who left the military before they turn 50 have a very hard time because they haven’t reached retirement age. Huang said, many soldiers became unemployed after leaving the military and have no opportunities for job training. Their monthly living allowance is not even enough for medical bills. Near the end of October, a number of veterans protested in downtown Changsha in Hunan Province in south-central China. More than ten Vietnam War veterans held banners protesting their impoverished living conditions and asking for help from the government. The event attracted a crowd of over a thousand, some showing their support for the protesters. Fearing that this protest will turn into a mass riot, the local officials immediately sent hundreds of Chenguan (The City Urban Administrative and Law Enforcement Bureau has an agency in each major Chinese city; this extra-legal police force uses violence and bullying to intimidate Chinese citizens) to forcefully disperse the veterans. Liu Qing, a human rights activist in New York said that the Chinese regime treats active soldiers and veterans completely differently. “The Chinese Communist Party’s (CCP) method is to kick away those who can no longer be of use,” Liu said. “Active soldiers, especially officers are treated very well. Read the original Chinese article.